“If you love a beautiful expanse of green as a ground cover, you can have that with moss,” says Annie Martin, a.k.a. Mossin’ Annie, a professional mosser from North Carolina. “A moss lawn is not totally carefree, but it’s not nearly as much work as a conventional lawn. It's also much better for our environment." Martin’s company, Mountain Moss in Pisgah Forest, NC, has installed moss lawns as large as 1500 square feet (25’ x 60’) at Camp Merrie-Woode in Sapphire, NC. If you are frustrated by the difficulty of growing grass in certain areas of the yard, consider these tiny bryophytes as a ground cover. In this step-by-step, learn how to choose the right site and why choosing the right moss species for your site can make a big difference. 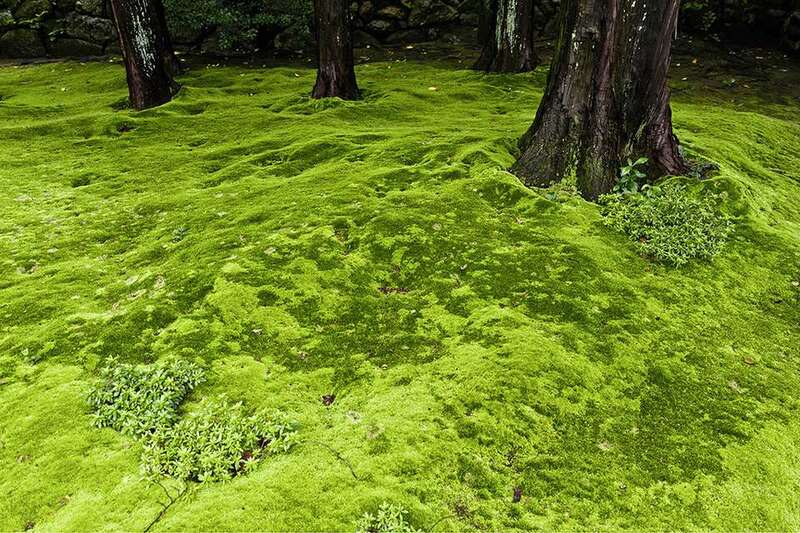 Photographer J. Paul Moore of Nashville, TN, noticed moss in his lawn. Finally, he decided to have a lawn of moss alone. Photography by J. Paul Moore. Taken from The Magical World of Moss Gardening© Copyright 2015 by Annie Martin. Published by Timber Press, Portland, OR. Used by permission of the publisher. All rights reserved. Sun exposure is a big consideration in site selection. For areas that are sunny part or all of the year, species selection is really important. “Some species are perfectly happy in sun,” says Martin. Martin says she has planted steep hillsides with moss patches and successfully secured the patches with tiny twigs. “Moss stands up very well to rain on a hillside once it is established,” she says. “It can also help reduce erosion.” Moss holds a great deal of its own weight in water. Polytrichum and Climacium mosses are good choices for erosion-prone areas, as well as Thuidium, according to Martin. Contrary to what many believe, moss can tolerate light foot traffic. “It does not hurt the plant to be crushed,” says Martin. In fact, she recommends walking or sitting on newly installed moss daily (bare feet, anyone?) to help the plants attach to the growing surface. Moss grower Annie Martin suggests several mosses for special situations. If you want moss that emulates the height and appearance of a lawn and has a high tolerance for foot traffic, Atrichum undulatum offers a solution. Although an upright grower, it provides a consistent height for a horizontal expanse of translucent green. (Common names include big star moss, crane moss, crown moss, and starburst moss.) It prefers shady, moist soil. A close relative, Atrichum angustatum, is less choosy about soil conditions. Some mosses can actually handle a bit of mowing if you want the flat look of a lawn. Another versatile species is Leucobryum glaucum (pincushion moss or white moss), as well as its relative Leucobryum albidum. These species grow all over the globe in a wide range of temperature, sun and soil conditions. For waterlogged areas or storm water control, plant Climacium americanum (tree moss). For drier areas with plenty of shade and acidic conditions, use Dicranum scoparium (mood moss, windswept moss, broom moss, footstool moss, or cushion moss). Finally, Thuidium delicatulum likes shade but tolerates the sun. It thrives on many different surfaces and is a good choice for moss lawns. If you want to succeed with a moss lawn, stop using lime on the area. Lime raises soil pH, which makes the area more conducive to grasses and weeds. Many mosses grow best in low pH (acidic soil), but you do not necessarily have to use acidifiers either. “While most moss thrives in acidic conditions, some species are rather indifferent to this factor,” says Martin. The key point is that many other plants grow very poorly in acidic soil. Be sure to have a consistent water source. Martin uses overhead oscillating sprinklers for home gardens and misting systems for larger installations. Use a timer, in either case, for a "set it and forget it" approach. Spray for two to five minutes, three times per day during dry spells.